Ask fellow campers about "Shelby RV Park & Resort" and nearby attractions. Question: How is the WIFI in this RV park? Answer: My notes from last year indicate the park had excellent & fast WiFi. Nice looking park behind, and associated with a motel. Beautiful bathrooms and showers. Roads and sites are gravel covered but extremely rutted and soft. Just about got stuck and bottomed toad. Don't think I will return. Some train and hiway noise. We camped at Shelby RV Park & Resort in a Motorhome. Big rig friendly with level sites. Convenient on/off excess to I15. Laundry and showers were good. Wi-fi worked majority of the time. Comfort Inn had a great indoor pool, hot tub, exercise room, and fast wi-fi free for the campground. No dog park but large field to walk dog. No problem with our satellite and campground had ten cable channels. We camped at Shelby RV Park & Resort in a Travel Trailer. Albertsons and small downtown was 2 miles. Nothing to do in the area but a good overnight stop. Pretty much an open parking lot with some grass between sites. Back in sites are somewhat level While the pull thru are mounded. Four channels on cable tv but open sky for satellite. Clean bathhouse and laundry. Can use the amenities of the Comfort Inn with Casino. Easy on and off I-15. We camped at Shelby RV Park & Resort in a Fifth Wheel. All sites are gravel and appear level, though some have serious ruts. Most sites are pull-through, with a few back-ins around the perimeter. The train noise seemed to stop by midnight, or at least it didn't wake me once I was asleep. Registration is inside the Comfort Inn motel, which is where FREE cookies are available. RV guests also have access to the facilities of the motel including the indoor pool. There are no picnic tables or fire rings at sites. Why this is called an RV Park & Resort is beyond me as the RV area is simply an open field. Maybe it is because there is a csino in the motel? Next to the RV park is a Pilot gas station that gives GS members an 8 cent a gallon discount on diesel fuel. There are a few restaurants and an Alberton's grocery store in town. We camped at Shelby RV Park & Resort in a Fifth Wheel. Nightly rate was for a 50 amp pull-through site including a Good Sam discount. The park is very convenient just off and to the east of I-15. We did not notice any Interstate road noise or train noise. There are several train tracks which appear to be part of a switching yard just to the north of the park, but all the roads pass over the tracks so there is no train horn noise as there are no crossings. This RV park is part of a Comfort Inn, and you use the Inn desk to register for the RV park. 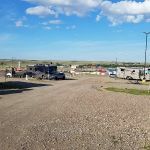 The RV park is located to the south of the Comfort Inn parking lot, and is a well defined RV park separated from the Comfort Inn. This is not just a gravel parking, as previously described. Check it out on Google Maps, Satellite view if concerned. The middle row is pull through sites and the outer rows on either side of the middle row are back in sites. The utility pedestals look almost new. Satellite access is good throughout the park as the park is open with only a few small trees. RV park residents have full access to the Comfort Inn indoor pool and jacuzzi open 24x7 with a pass card provided to you at check in. Park residents can also take advantage of a hot breakfast at the Inn for $6/person. We camped at Shelby RV Park & Resort in a Motorhome. There is a Flying J truck stop just prior to accessing the RV park, but be aware that each of the truck islands also have a #1 Diesel pump in addition to the standard #2 diesel / DEF pumps. We managed to accidentally overlook the fact that the pump we started using was for the expensive #1 diesel fuel, no problem, except for the price. There is also a nice IGA grocery just down the Main Street. Really just a parking lot but extremely level cleanest restrooms in 2 months on the road - excellent gas prices - bought breakfast at the Comfort Inn for $6.00 per person because we stayed at the RV park - good value. We camped at Shelby RV Park & Resort in a Travel Trailer. This is not 8! It will be an 8 when the trees grow in about 10 years, but not now. I totally agree with the last reviewer. "A gravel parking lot behind a Comfort Inn. Full hook ups, good WiFi and Verizon wireless network. Nice bathrooms and showers. Access to pool, hot tub and exercise room. Casino and restaurant inside hotel. We camped at Shelby RV Park & Resort in a Fifth Wheel". The low numbered back-ins are good in terms of sun placement, The pull-thrus have better separation and the grass between sites is better. We will not stay here again. We camped at Shelby RV Park & Resort in a Fifth Wheel. A gravel parking lot behind a Comfort Inn. Full hook ups, good WiFi and Verizon wireless network. Nice bathrooms and showers. Access to pool, hot tub and exercise room. Casino and restaurant inside hotel. We camped at Shelby RV Park & Resort in a Fifth Wheel. A good layover location convenient to the interstate and US 2. Small town with limited restaurants and shopping. Were only going to stay one night but decided to stay 4. While not much to do in Shelby, this park is very nice. Breakfast at the motel is good: $6.00 if in the RV park. Full access to the pool, hot tub and fitness room. Lots were spacious. Site surface was gravel and grass. We would stay here again when in the area. We camped at Shelby RV Park & Resort in a Motorhome. There are a couple restaurants and bars within walking distance. Not a resort! But convenient for overnight. We stayed one night. Don't get your hopes up; this is a basic park, unless you define a picnic table as a resort. A train horn a couple times overnight was startling, to say the least. A few noisy vehicles too, but I don't think they were on the highway. Very bright parking lot lights make it seem like daylight all night-use blackout shades! The electric is clean, water is a good 55 PSI. On the back-in sites the sewer is at the rear, so you'll need more than 20' of sewer hose to reach it if your RV is like ours. Pull-through sites have 2 well-located sewer options. The park is on a hillside; roads are good packed gravel. We tried 3 back-in sites; none were level, though they seem to have tried using an excess of gravel to level them, leading to deep ruts (to be level, we'd have had a set of rear wheels off the ground-and ours was the best of the 3!). Pull-through sites may be better. 5ers and trailers will have it easier than our motorhome. The counter help at check-in were pleasant, but they are ignorant of RV requirements. No trees over 6', so satellite sight-lines are excellent. WiFi is excellent. The bathroom building looks to be new. We didn't try use motel amenities. We camped at Shelby RV Park & Resort in a Motorhome. Garmin GPS does not recognize the park-use the address or Comfort Inn. This is a great spot -- check in at the Comfort Inn behind the Exxon Gas Station (Town Pump) just before coming to Interstate 15 (if coming in from the east on highway 2). Immaculate and new looking restrooms and showers, nice sight. . We would definitely stay here again -- good for an overnighter or a base camp to explore nearby East Glacier National Park. We camped at Shelby RV Park & Resort in a Travel Trailer. This place has good things going for it...and bad things. The good includes clean restrooms & solid utilities and amenities and a nice welcome at the Comfort Inn desk when checking in. Comfort Inn amenities were not used, but might be nice another time. Buffet breakfast is $6 if desired. The bad includes some sites not level enough, stadium lighting in the park makes blackout shades a must. The sites are on a hill and exposed entirely to Montana wind and weather. Due to proximity to the interstate and services provided we would stay again for a night. We camped at Shelby RV Park & Resort in a Motorhome. Three restaurants are walkable just down the hill. Country Skillet in the truck stop, Rib/BBQ restaurant in mini casino and next door a Mexican restaurant, El Tanampa, which was excellent and also had a bar and sports TV's. We had originally intended to stay here only one night, but we were so pleased with our site, the service and the hotel amenities that we extended our stay. We had a nice little patch of green grass, a picnic table, a level site, cable TV and great WiFi. The park isn't very old and the plantings need some time to grow and give shade, but we thought the landscaping was very nice. Shelby proved to be a very nice place to rest up after a long drive and stock up on groceries/supplies at the Albertsons and Shopko. The hotel allowed us access to the exercise room, sauna, hot tub (which was blissfully hot) and swimming pool. There is an extensive breakfast bar available in the morning, but we did not partake. We camped at Shelby RV Park & Resort in a Fifth Wheel. Historians will enjoy the Marias Museum of History and Art in Shelby. It's free but leave a donation. Anglers/hunters will enjoy the Marias River (south of Shelby) with warm water fishing and hunting. Stop in the Prairie Peddler for coffee or to pick up a local gift. They have tons of items to choose from for gift giving, including decorative items, Montana crafts and sweet-tooth teasers. Surprised that this is another park associated with a hotel. Hard to find office which ended up being in the hotel. Sites are all gravel. First one we tried was not level at all. We had no problem switching. They are long enough for our 38ft 5th wheel & truck. Some sites don't have much grass and are muddy after rain. Utilities work well - even decent wifi! Cable works but not very good picture. The place worked for us on our way to Glacier, but not what we typically like in a RV park. We camped at Shelby RV Park & Resort in a Fifth Wheel. We stayed for several days. The CG was clean, had good water pressure, good Wi-Fi, cable TV and the staff was very cordial. The manager and her staff were more than helpful by answering all our questions and telling us places to eat, get gas and tourist information. As CG guests we were allowed to use all the facilities including the spotless pool, exercise room and sauna. The laundry at the CG had good equipment and was clean with fair prices. The sites were all large gravel and would accept any large rig. If there were more stars to give this facility I would give it the highest score available. When we visited this CG we were on a cross country trip and liked it so much we are returning there on our trip back East. We camped at Shelby RV Park & Resort in a Fifth Wheel. Found the down town interesting and visited Glacier Park during our stay. Historians will enjoy the Marias Museum of History and Art in Shelby. It's free but leave a donation. Anglers/hunters will enjoy the Marias River (south of Shelby) with warm water fishing and hunting. Stop in the Prairie Peddler for coffee or to pick up a local gift. They have tons of items to choose from for gift giving, including decorative items, Montana crafts and sweet-tooth teasers. Not much here but we golfed at Marias Valley. One of the nicest courses we have ever played. Beautiful scenery, nestled in a deep valley. Greens in tip top shape. Reasonably priced. breakfast downtown at The Griddle! Shelby is a small town but everyone is friendly. We stopped by the visitors center and they could not have been more helpful. Shelby has an Albertson's on the east side and Shopko Homeplace on the west side. Are you affiliated with Shelby RV Park & Resort ?